Hi friend! I hope you’ve had a splendid week. I’ve been loving all the adventures I’ve been having out on the East Coast since I’ve been back. Lots of hiking, tons of family time, weekly trivia (no big deal but we totally won the other week), swimming, teaching yoga, and working with my fabulous clients. Today I’m going to share my very favourite go-to smoothie for those days when I just don’t have time to whip up a full meal or if I know I’m going to be out of the house for an extended amount of time. I’ve been drinking smoothies every day (check out a few of my favourites here!) and it’s just a great way to make sure I get all the nutrition I can when I’m too busy, or lazy, to cook a meal. Sometimes I don’t put the banana in if I’m going to leave it sitting for a couple of hours though because personally I find it can make it taste a little wonky. Anyhoo, this bad boy is chock-full of antioxidant goodness, plus it tastes like cake, so win-win! Let’s take a quick peek the all-star cast. These delicious little balls of goodness are an antioxidant powerhouse! Antioxidants help prevent inflammation in the body, which helps keep your waistline slim, your joints healthy, and your skin clear. Look for wild blueberries if possible, but organic is also a good option. Moov sells giant bags of wild frozen blueberries for super cheap at Costco! When combined with blueberries, the antioxidant capacity of raw cacao is even stronger! Not only is cacao an amazing source of AIs, but it’s also one of the highest food sources of magnesium, which is necessary for over 300 enzymatic reactions in the body and helps keep your muscles relaxed and your minds calm. Bananas are a great source of potassium, a mineral which is necessary to regulate electrolyte/fluid balance in the body. They’re also a great source of healthy carbohydrates perfect for replenishing glycogen stores (basically the stored glucose molecules you use for energy) after a tough workout. Full of healthy fats that have anti-viral and anti-fungal activities in your body thanks to the medium chain triglycerides, lauric and capryllic acid. Coconut oil also helps keep you fuller, longer and initiates increased the burning of stored body fat. Some early research and anecdotal information suggests it may help with neurological function. Woohoo!! So now that you know what you’re putting in your body and why, let’s take a look at the super simple recipe! 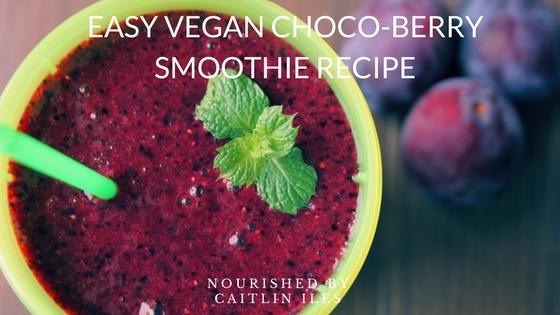 This smoothie is the perfect quick & easy easy to start your day with a nutrient punch! Combine all ingredients in a blender and mix together until smooth. Well there you have it friend! An easy, breezy smoothie to help you start your day chock full of antioxidants and energy. If you’re looking for more healthy living inspiration and support, join my Nourished community and get my FREE Stop Self-Sabotage Workbook full of tips and tricks to help you achieve your goals.